The Indo-Portuguese Museum, located within the premises of the Bishop’s House, displays various artefacts collected from different churches. The museum, preserves the rich heritage of Indo-Portuguese culture, art and architecture in Kerala, owes its origin to Dr Joseph Kureethra, the erstwhile Bishop of Kochi. 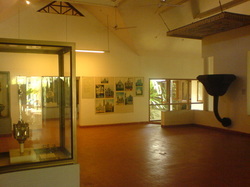 The museum houses an invaluable collection of artefacts that reveal the Portuguese legacy in Fort Kochi and the surrounding areas. The collection is divided into the five main sections - Altar, Treasure, Procession, Civil Life and Cathedral. The old altar made of teak wood which belongs to the 16th century. An Indo-Portuguese Monstrance is also on display. A chasuble and a processional cross collected from Santa Cruz Basilica bear witness to the strong Portuguese influence in Kochi. The processional cross is made of silver and wood and belongs to the 17th century while the chasuble, belonging to the 19th century was obtained from the Bishop’s House. There are a lot of sculptures and precious metal objects on display at the museum and many of them were contributed by the Calouste Gulbenkian Foundation. Beautifully carved artefacts, an ornate lock and a sculpture of the Franciscans Coat of Arms are some of the objects that attract many a visitor to this place. The remnants of the Fort Immanuel too are also kept in the basement of the museum. Though limited in the number of exhibits, the museum helps the visitor get a glimpse on the strong Portuguese influence on Kochiite’s life and the objects at the museum are kept intact with clear labeling.